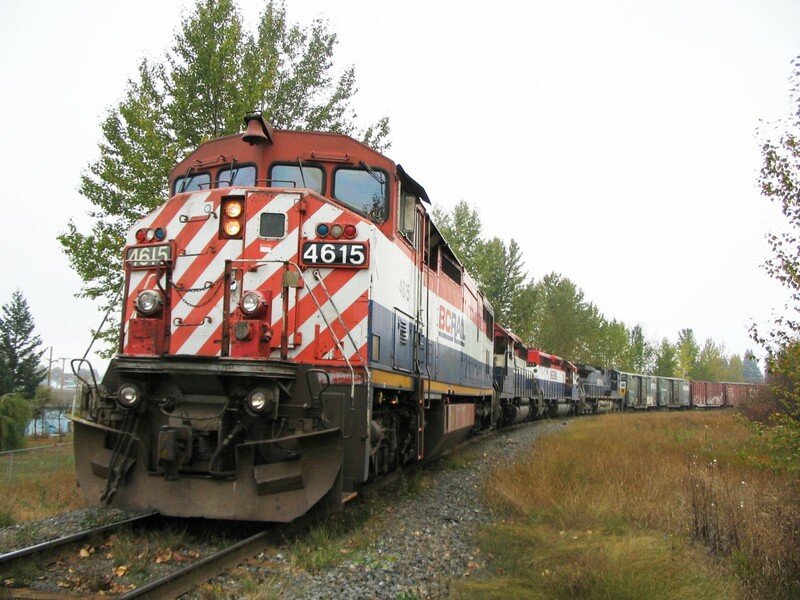 Railpictures.ca - Doug Lawson Photo: Pumping air at Quesnel on this overcast fall morning.The overhead haze is a combination of cool weather fog and some pulp mill smog. With four units on the headend, most likely the trailing unit was setup for DPU. Due to number of powered axle restrictions one of the units would be in idle, bet it was the lead unit. Soon we would continue south to Williams Lake. | Railpictures.ca – Canadian Railway Photography – photographie ferroviaire Canadienne. Caption: Pumping air at Quesnel on this overcast fall morning.The overhead haze is a combination of cool weather fog and some pulp mill smog. With four units on the headend, most likely the trailing unit was setup for DPU. Due to number of powered axle restrictions one of the units would be in idle, bet it was the lead unit. Soon we would continue south to Williams Lake.